Willowood Glufosinate 280SL (OT) is a non-selective herbicide for post-emergence broadcast use on canola, corn, cotton, and soybean designated as LibertyLink®. Willowood Glufosinate 280SL (OT) may be used for weed control in non- LibertyLink® cotton when applied with a hooded sprayer in-crop. 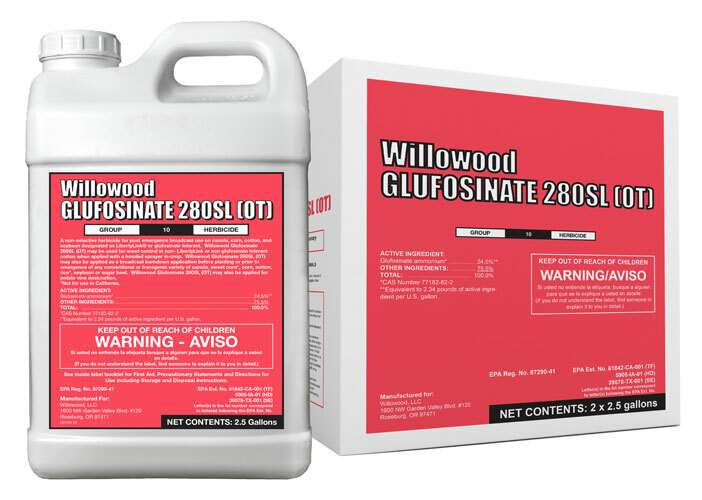 Willowood Glufosinate 280SL (OT) may also be applied as a broadcast burndown application before planting or prior to emergence of any conventional or transgenic variety of canola, sweet corn, corn, cotton, olive, rice, soybean or sugar beet. Willowood Glufosinate 280SL (OT) may be used for post emergence weed control in listed tree, vine and berry crops. Willowood Glufosinate 280SL (OT) may also be applied for potato vine desiccation. For specific use instructions see back or refer to Willowood Glufosinate 280SL (OT) product label. **Equivalent to 2.34 pounds of active ingredient per U.S. gallon. LIBERTY® is a registered trademark of BayerCropScience.